What About Paris? : Easter Rising 1916: 103 years ago in Dublin. Easter Rising 1916: 103 years ago in Dublin. 460 killed, 2600 wounded, 16 executions. 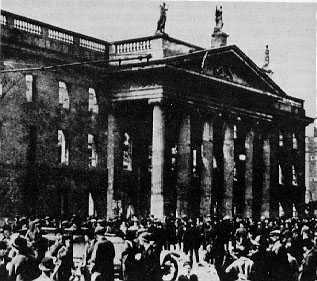 The proclamation was read by Patrick Pearse outside the General Post Office in Dublin on Sackville Street (since 1924 O'Connell Street)--and the Rising began. It was modeled on a similar if less well-supported proclamation by Robert Emmet in 1803. The proclamation in 1916 was an actual declaration of a Republic. Emmet is more known for his speech from the dock when he spoke of Ireland one day taking its place (free) among nations of Earth. I don't think he ever actually proclaimed a Republic, he lead what in effect was a mob, sadly inebriated down Thomas Street in 1803. A noble effort and a tragic end to what would surely have been a brilliant legal career.